Luke Parker and Jake Lloyd celebrate a goal against Geelong in Round 11, 2014 at the SCG. For a long time Thursday nights were best known in Australia for late night shopping. And, in a football sense, it was selection night. In a time now unthinkable for many, when Thursday night was the only night the shops were open beyond 5pm, a lot of everyday fans would do their weekly shopping and race home to find out who was playing for their team that weekend. It was just how it was. And still is from a selection viewpoint. One Thursday night in particular has a special place in Swans history. For two reasons. Thursday night, 29 May, 2014, was the first Thursday night game at the SCG. And it was the night on which the club had its all-time high possession count. Fifth on the ladder coming off a bye, the Swans took on the second-placed Cats in Round 11 and kicked eight goals in the final quarter to win 22-16 (148) to 5-8 (38). The 110-point win is the Swans’ biggest in 223 games against Geelong, and the team possession count of 467 is the most in Swans games since the inception of possession counts in 1965. Nick Malceski, in his last seasons with the Swans, had a career-best 37 possessions to earn three Brownlow Medal votes. Craig Bird had an equal career-best 33 possessions, and four other Swans topped 30 – Josh Kennedy (32), Luke Parker (32), Rhyce Shaw (31) and Dan Hannebery (30). Kurt Tippett kicked five goals for one Brownlow vote, and Lance Franklin four goals for two votes. Remarkably, every Sydney player had 10 possessions or more, and 11 topped 20. Even more remarkably, the total of 467 possessions ranks only equal 37th on the all-time AFL list and is 53 short of the League’s all-time high of 520 set by St.Kilda against Fremantle in 2013, when Leigh Montagna and Jack Steven had 47 apiece and the Saints out-possessed the Dockers by 229 possessions in a 71-point win. To put the record number into perspective, in the first three rounds of 2019, the Swans possession count has been 369 in Round 1 v the Bulldogs, 381 in Round 2 v Adelaide, and 410 in Round 3 v Carlton. The average disposal count in 2018 was 396 after it was 372 in 2017 and 2016. The first Thursday night AFL premiership match was played on 27 March 1997. It was Round 1 when Melbourne, coached by Neil Balme, beat North Melbourne, coached by Denis Pagan, by 15 points at the MCG. Brownlow Medallist Shane Woewodin made his debut for the Demons. Since then it has been a fairly regularly occurrence on the AFL fixture. Not every year, but often in the first couple of rounds when the AFL has looked to properly accommodate Easter and provide a boom start to the season. The Swans have hosted five Thursday night games at the SCG for a 3-2 win/loss record. In Round 14 2015 they beat Port Adelaide by 10 points. Toby Nankervis made his AFL debut as Hannebery (34) and Kennedy (33) led the possession count again, and Adam Goodes and Sam Reid kicked three goals. 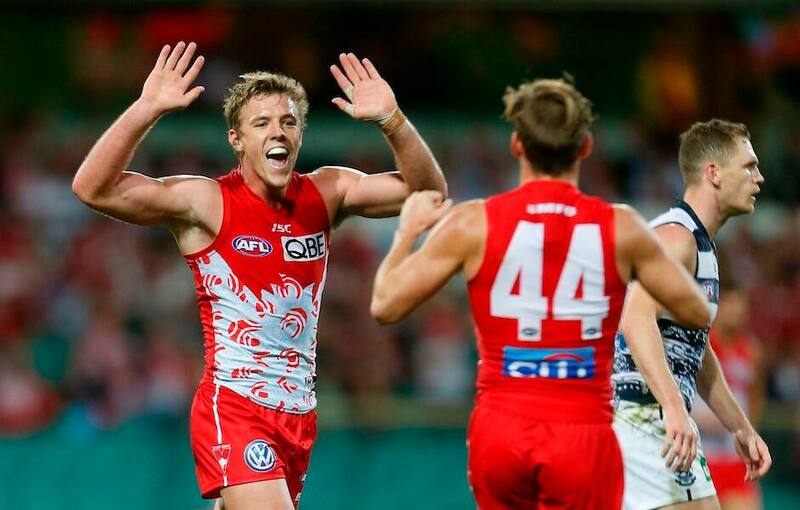 Kennedy, Parker and Hannebery received the 3-2-1 Brownlow votes. In Round 17 2016 a goal from Cyril Rioli in the final seconds cost the Swans a win against Hawthorn. Having led by seven points when the time clock showed 25:51 in the final term, the home side conceded one goal to Shaun Burgoyne before Rioli struck. Parker (35), Tom Mitchell (34) and Kennedy (33) led the possessions and Gary Rohan kicked four goals. Kennedy received one Brownlow vote. In Round 12 2017 the Swans beat the Western Bulldogs by 46 points, holding the visitors to six goals. Kennedy (37) and young guns Isaac Heeney (31) and Jake Lloyd (31) were prolific again as Heeney topped the Brownlow votes from Sam Reid and Heath Grundy. And last year, in Round 16, Sydney lost by 12 points to Geelong. Lloyd had 33 possessions, Franklin kicked four goals, and Parker picked up one Brownlow vote. Tonight, when the Swans host Melbourne at the SCG, three members of the home side will play their first Thursday night game – debutant Justin McInerney, fourth-gamer Nick Blakey and eighth-gamer Jordan Dawson. Ex-Geelong utility Jackson Thurlow, too, will play his first Thursday night game for the Swans after making his debut for his second AFL club last week. Kieren Jack’s return to the side for his 249th game means he will be one of six Swans players to have played in each of the club’s six Thursday night games at the MCG. The others will be Kennedy, Zak Jones, Lloyd, Parker and Dane Rampe.